Michael Douglas, Robert De Niro, Morgan Freeman and Kevin Kline. Between them they boast five Academy Awards and a further nine nominations. With Last Vegas the stars have aligned, enabling these four greats of the screen to come together and do the least ambitious work of their career. One can only assume that the lure of an easy pay cheque for a few weeks of not particularly demanding work with some old friends in Las Vegas was too good for them to turn down. However, just because they might have had fun making the film doesn’t mean that you are going to have fun watching it. Billy, Paddy, Archie and Sam have been the best of friends since they were kids, but as they hit their twilight years, life has got a bit tougher. Paddy’s wife has passed, Archie has had a stroke, Sam has lost his spark. When Billy, the eternal bachelor, announces that he is engaged to a woman young enough to be his daughter, Archie and Sam decide that a bachelor party in Las Vegas is just what the group needs to put a bit of a spring back into their step. But such an event means bringing together Billy and Paddy, who have had a falling out. Obviously trying to tap into the success of The Hangover (at least the first one) and Bridesmaids – two films which in their best moments were quite subversive – this tale of old men behaving badly sets the bar pretty low. 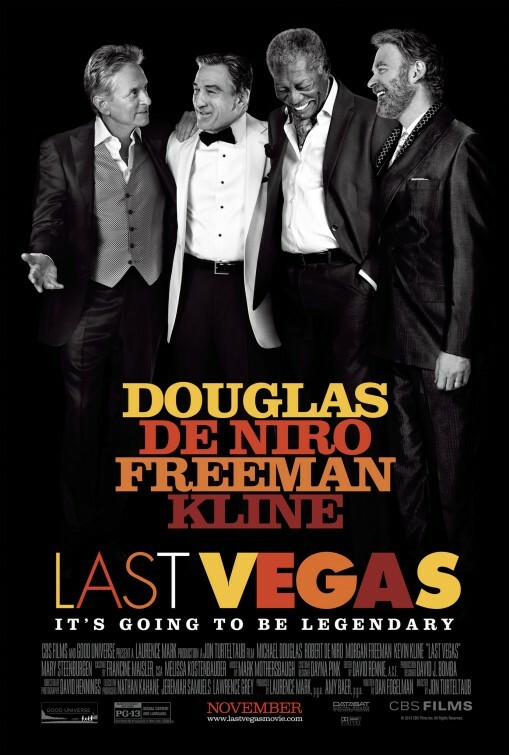 Last Vegas is exactly what you imagine it is going to be and nothing more. You get bombarded with cheap laughs about bad hips, medication, poor hearing, obliviousness to popular culture and, of course, Viagra. Douglas, De Niro and Freeman are all playing to type; Douglas as the sleaze, De Niro as the curmudgeon and Freeman as the irreverent old guy with a bit of perspective on life. It is only Kline who succeeds in creating a vibrant and engaging character, which is problematic as the lion’s share of screen time goes to the less interesting dramatic conflict between Douglas’s Billy and De Niro’s Paddy. Mary Steenburgen, as lounge singer who catches the eye of both Billy and Paddy, is quite charming and proves herself to have quite a voice. You can’t help but feel the whole film is summed up in one particularly low moment which sees Robert De Niro, one of the absolute legends of the American cinema, sit uncomfortably while LMFAO singer and X-Factor Australia judge Redfoo thrusts his speedo clad crotch into his face. In the end the goodwill engendered by the quality cast only goes so far in disguising what is otherwise an entirely unremarkable piece of fluff.